BACKGROUND AND PURPOSE: To assess by diffusion-weighted MR imaging (DWI) the efficacy of cerebral protection devices in avoiding embolization and new ischemic lesions in patients with severe internal carotid artery (ICA) stenosis undergoing carotid artery stent placement (CAS). METHODS: One hundred sixty-two CASs in the extracranial ICA were performed with the use of distal filters. Mean age of the patients was 68.5 years (range, 33–86) and 122 patients (75.3%) were symptomatic. MR imaging was performed in all patients during the 3-day period before CAS, and DWI was obtained within 24 hours after the procedure. Ninety-five patients (58.6%) were monitored by transcranial Doppler ultrasonography for microemboli detection in the territory of the middle cerebral artery (MCA), ipsilateral to the vessel being treated. RESULTS: Twenty-eight patients (17.3%) showed 58 new ischemic foci in DWI, and 13 patients (46.4%) had multiple foci. Location of new lesions was mainly in the vascular territory supplied by the treated vessel (19 patients; 67.9%), but also in the contralateral MCA (1 patient; 3.6%), and the posterior fossa (4 patients; 14.3%). A significant relationship (P < .03) was found between occurrence of transient ischemic attack (TIA) and appearance of new lesions. Microembolic signals (MES) were detected in 88 patients (92.6%), with no relationship between number of MES and the appearance of new ischemic foci. CONCLUSION: New ischemic foci were observed in 17.3% of the patients undergoing neuroprotected CAS. Appearance of new ischemic lesions were only significantly related to the occurrence of TIA but not to the number of MES registered or other variables. Despite the encouraging results, the incidence of new ischemic lesions should promote research for safer techniques and devices. Carotid angioplasty and stent placement (CAS) for severe internal carotid artery (ICA) stenosis has been introduced as a safe alternative to medical and/or surgical treatment in patients at high risk for surgical procedures and for suffering new strokes if left untreated.1 Nevertheless, there is still concern regarding its safety because of the risk of cerebral embolization during the procedure.2-4 Several devices have been designed to protect against distal embolization during CAS after Theron et al5 first proposed the concept of cerebral protection. Despite the use of distal protection, microembolic signals (MES) are usually found when CAS is monitored with transcranial Doppler ultrasonography (TCD). Although MES are frequently of little clinical significance,6,7 they have the potential to produce brain ischemic lesions and consequently new neurologic symptoms. 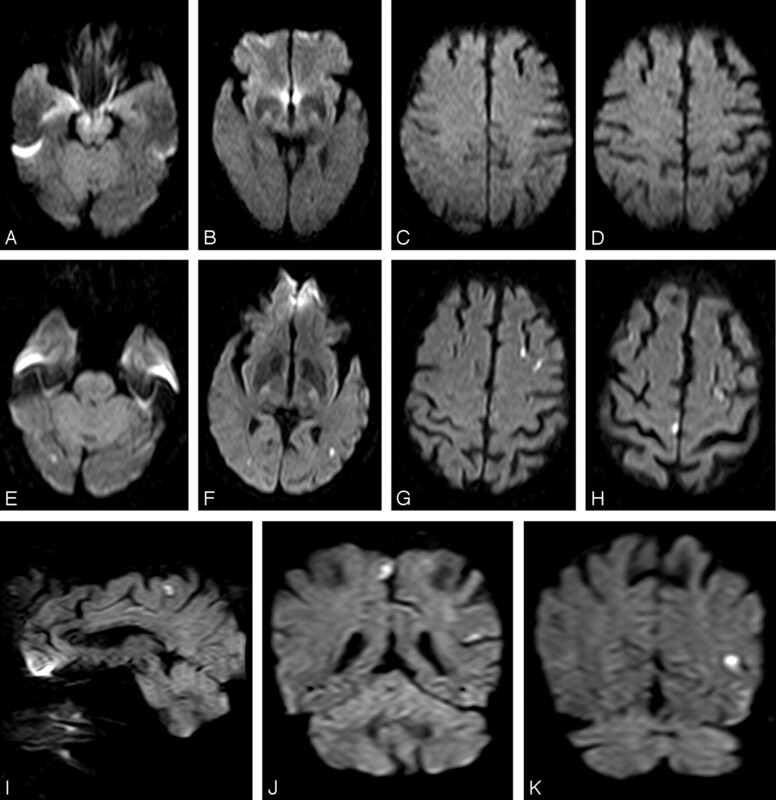 Diffusion-weighted imaging (DWI) is considered the most sensitive tool for early detection of cerebral ischemia,8-12 independent of its clinical relevance. The purpose of this prospective study was to evaluate the appearance of new ischemic cerebral lesions by DWI after protected CAS in patients with severe ICA stenosis and to assess their clinical significance. From July 2003 through January 2005, 162 consecutive patients with ICA stenosis ≥70%, according to the North American Symptomatic Carotid Endarterectomy Trial (NASCET) criteria,13 were included in the study. Symptomatic patients had transient ischemic attack (either retinal or hemispheric) or nondisabling stroke (modified Rankin Scale ≤2). Asymptomatic patients were included if stenosis progressed to 80% by Doppler ultrasonography examination of the supra-aortic vessels, positive microemboli were detected by TCD, hemodynamic reserve was exhausted, or silent lesions on CT/MR were documented. 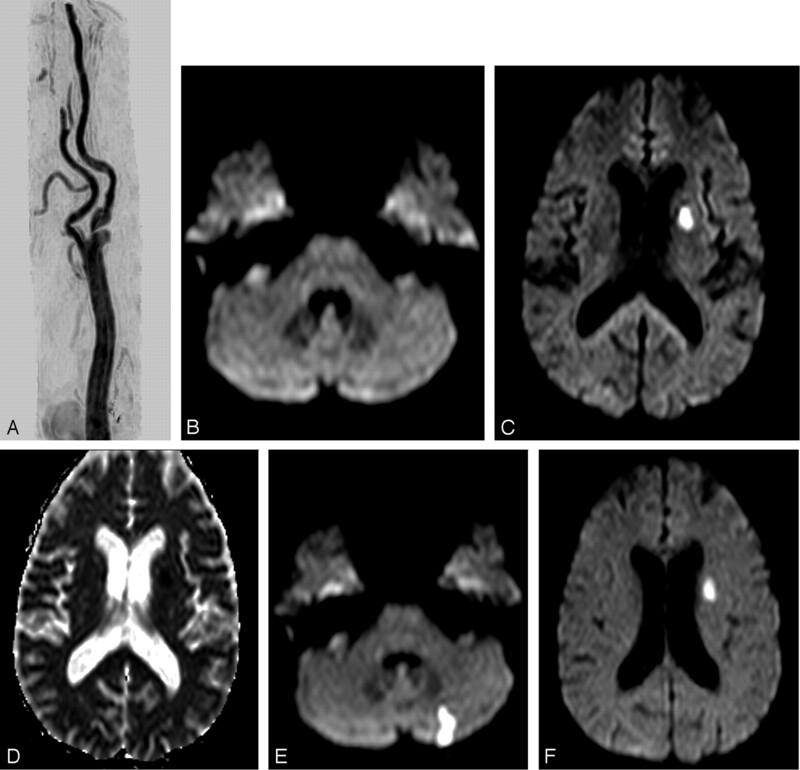 Exclusion criteria included intramural thrombus, excessive vessel tortuosity precluding filter use, patients with disabling stroke, and those with any contraindication for MR imaging examination. During the inclusion period, CAS was the only therapeutic procedure used for ICA stenosis in our hospital. All consecutive patients satisfying the inclusion criteria were included in this study. The study was approved by our Institutional Review Board and written consent was obtained from all patients. All procedures were performed by 2 experienced interventional neuroradiologists (A.G., A.M.). Angiography of the supraaortic vessels and of both extra- and intracranial carotid and vertebral arteries was performed by using the femoral approach in all patients. ICA stenosis was measured by using the NASCET protocol. Electroencephalogram, electrocardiogram, and continuous arterial blood pressure were monitored. Hemodynamic changes, such as hypotension (decrease in systemic arterial blood pressure ≥30 mm Hg), bradycardia (≤40 bpm), asystole (cardiac arrest ≥5 seconds), and syncope (sudden loss of consciousness, usually with additional clinical features and spontaneous recovery) were recorded. A 6F, 90-cm-long sheath catheter was positioned in the common carotid artery (CCA). For cerebral protection, 4 different types of filters were used: EPI and EZ FilterWires (Boston Scientific/Target Therapeutics, Fremont, Calif), Spider (ev3, Plymouth, Minn), and Accunet (Guidant, Santa Clara, Calif). After crossing the ICA stenosis, the self-expanding basket-type filter of various pore sizes (80–130 μm) was deployed distal to the lesion to maintain cerebral perfusion and capture any debris liberated during the intervention. In all patients, predilation of the ICA lesion was done by using a 3 × 20-mm catheter balloon. A self-expandable stent was placed in the ICA-CCA: carotid Wallstent and NexStent (Boston Scientific/Target Therapeutics), carotid Acculink (Guidant), Precise (Cordis/Johnson & Johnson Co, Warren, NJ), or Protege (ev3). Postdilation was performed with a 5- to 6-mm balloon catheter. An independent neurologist (E.M., J.R.G.-M., A.G.-P.) with special expertise in stroke performed neurologic examination during CAS in all patients. Neurologic examination and a Doppler ultrasonography examination of the supra-aortic vessels were done the day after the procedure and after 1, 3, 6, and 12 months. TCD monitoring was done with an Embo-Dop (DWL, Elektronische Systeme GmbH, Sipplingen, Germany). The ipsilateral middle cerebral artery (MCA) was insonated with the use of a 2-MHz probe. For practical purposes, detection of microembolic signals (MES) during the procedure was divided in 3 phases: (1) placement of the long sheath catheter in the CCA and filter-crossing and deployment, (2) angioplasty, stent placement, and filter retrieval, and (3) post-CAS 5- minute period. Patients were on aspirin (300 mg/day) and clopidogrel (75 mg/day) at least for 3 days, and unfractionated IV heparin for 24 hours before the procedure. Oral clorazepate dipotassium, 20 mg, was used in all patients. Heparin was administered systematically before intra-arterial catheterization to maintain the activated coagulation time (ACT) between 250 and 300 seconds. Intravenous atropine was used in patients with severe bradycardia or asystole during balloon inflation. Patients were discharged on aspirin (150 mg/day) and clopidogrel (75 mg/day). After a month, clopidogrel was removed but aspirin was maintained indefinitely. MR imaging scans were obtained in the 3 days before the procedure, and DWI 24 hours after it, using a 1.5T whole-body system (Intera, Philips Medical Systems, Best, The Netherlands). Protocol included sagittal and transverse T1-weighted spin-echo sequences (echo time [TE], 13 ms; repetition time [TR], 539 ms; matrix 256 × 256; 2 excitations), transverse T2/proton-attenuation-weighted (TE, 110/8; TR, 3402), transverse field echo–echo-planar (TE, 23; TR, 1460; flip angle, 20), coronal fluid-attenuated inversion recovery (FLAIR) (TE, 120; TR, 8000; TI, 2200), and 3D contrast-enhanced MR angiography of supra-aortic vessels (slab thickness, 60 mm; sections, 60; acquisition time, 46 seconds with a breath-hold of 15–20 seconds at the beginning of the acquisition). A standardized, automatic bolus injection of 0.2 mmol/kg body weight of gadopentetate dimeglumine (Magnevist) was used at a flow rate of 2.5 mL/s, followed by a saline solution flush of 30 mL, by using an MR-compatible power injector (Spectris; Medrad, Pittsburgh, Penn). DWI was obtained with a spin-echo echo-planar pulse sequence (TE, 95; TR, 3562; echo-planar imaging factor, 77; field of view, 240 mm; matrix, 128 × 256; section thickness, 6.0 mm; intersection gap, 1 mm; total acquisition time, 21.4 seconds) with diffusion sensitization b values of 0 and 1000 s/mm2. The higher level was applied in each of the 3 main gradient directions (x, y, and z planes). Apparent diffusion coefficient (ADC) maps were obtained in all cases. In 60 patients, the post-CAS DWI examination was obtained in the coronal, sagittal, and axial planes to be more accurate in lesion detection and delineation. A neuroradiologist (P.P.) blinded to the procedure assessed all MR images. In the T1, T2, and FLAIR sequences, abnormalities, such as atrophy (loss of brain parenchyma, widening of sulci, distended ventricles, and thinning of gyri), leukoaraiosis (diffuse and patched areas of chronic interstitial edema and loss of myelin), lacunar lesions (ischemic lesion with diameter ≤15 mm in the territory of lenticulostriate, thalamoperforating, and pontine perforating branches), and brain infarct (>15-mm ischemic area with a cortical or watershed distribution in the territories of anterior, middle, and posterior cerebral arteries or posterior fossa), were recorded. On the DWI, the presence of new ischemic signals, number, size (<5 mm, 5–10 mm, >10 mm), distribution (cortical, subcortical, or both), and vascular and anatomic distribution were recorded. The results of the preprocedural and postprocedural MR imaging were compared. Data were analyzed with the software package SPSS (SPSS, Chicago, Ill). Absolute numbers, percentages, and median (interquartile range) were computed to describe the patient population. Categorical variables were compared by χ2 test and Fisher exact test when appropriate. A probability value of P < .05 was considered significant. Demographic characteristics of the patients are shown in Table 1. Mean age was 68.5 years (age range, 33–86), and 131 patients (80.9%) were men. Symptomatic patients (75.3%) underwent the procedure at least 4 weeks after the initial symptoms, but in 16 patients (9.9%), it was done on an emergency basis. One hundred four patients (64.1%) had more than 3 vascular risk factors. Seventy-one patients (43.8%) would have been considered high risk for surgery, because of heart disease (21%), vascular emergency (9.9%), surgical or radiation treatment to neck (3.7%), kidney failure (2.5%), lung failure (1.2%), high level stenosis (1.2%), or other risk factors (4.3%). Procedure was performed in the right ICA in 56.2% of the patients and in the left ICA in 43.8%. Sixty-four percent of the patients had a ≥85% stenosis of the treated ICA. Most of the lesions were proximal, including the carotid bulb, and half of them were calcified or ulcerated. Twenty-six patients (16.1%) had an occlusion of the contralateral ICA. Other angiographic characteristics are shown in Table 2. All procedures were successfully completed in a mean time of 21 minutes (range, 8–110 minutes). Type of filter used was as follows: FilterWire EZ in 93 patients (57.4%), Spider in 41 (25.3%), FilterWire EPI in 19 (11.7%), and Accunet in 9 (5.6%). The type of stent placed was carotid Acculink in 84 patients (51.9%), carotid WallStent in 63 (38.9%), Precise in 10 (6.1%), NexStent in 4 (2.4%), and Protege in 1 patient (0.6%). In 3 patients (1.8%), 2 stents were placed. Predilation of the stenosis was required in almost all patients (95.7%), and postdilation after stent placement in 87.7%. Transient hemodynamic changes during balloon inflation were frequent: hypotension in 77 patients (47.5%), bradycardia in 90 cases (55.6%), and asystole in 53 (32.7%). Syncope occurred in 37 patients (22.8%) without clinical consequences. Occlusion of the filter occurred in 4 patients (2.5%), and intimal dissection postangioplasty in 25 (15.4%). No major vascular access site complications were registered. MES were detected in 88 of 95 procedures (92.6%) monitored by TCD, most of them during CAS and filter retrieval (Table 3). Eight patients (3.9%) developed ipsilateral transient ischemic attacks (TIA) immediately after CAS, always lasting less than 15 minutes. Seven of them had symptomatic ICA stenosis. There was 1 major ipsilateral stroke (0.6%) on the second day after the procedure, but no minor stroke, death, or myocardial infarction occurred in a 30-day period. Before CAS, the T1- and T2-weighted and FLAIR sequences showed abnormalities in 146 patients (90.1%). The most frequent findings were atrophy and leukoaraiosis (67.9% and 63% of the patients, respectively). 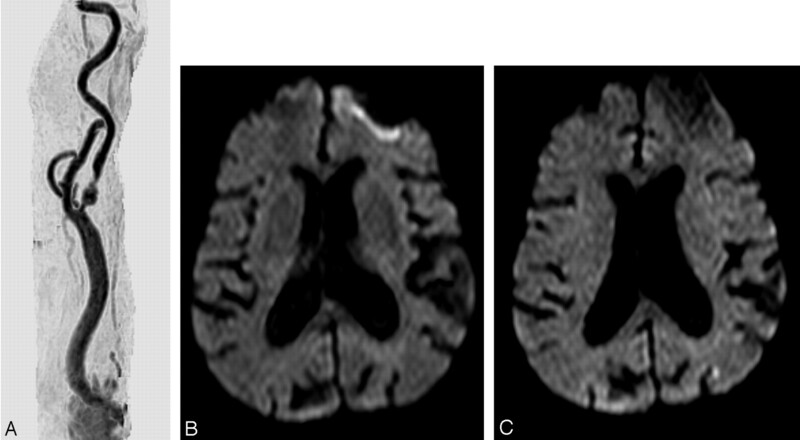 Lacunar infarcts and cortical ischemic lesions were seen in 27.8% and 40.1% respectively. 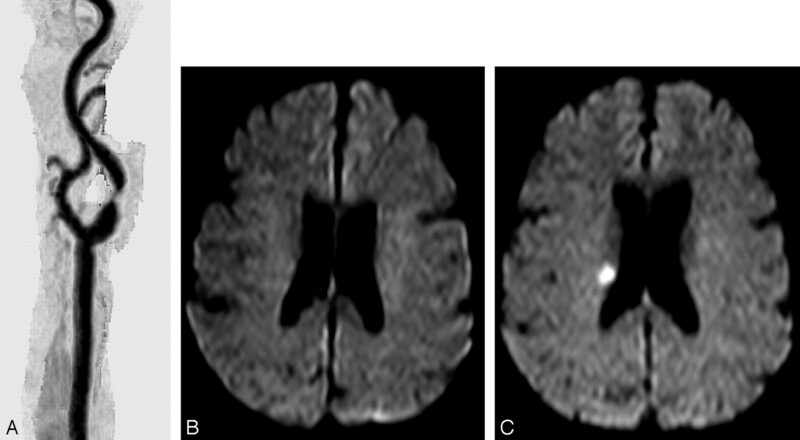 DWI showed ipsilateral acute ischemic cerebral lesions in 18 patients (11.1%). After CAS, DWI showed a total of 58 lesions in 28 patients (17.3%) (Table 4). In 15 of them (53.6%), there was a single lesion (Fig 1); in 13 (46.4%) patients, there were multiple lesions (Fig 2); there were 3 patients with 2 lesions, 6 patients with 3 lesions, 2 patients with 4 lesions, 1 patient with 5 lesions, and 1 patient with 6 lesions. In 19 patients (67.9%), lesions were located in the vascular territory supplied by the treated ICA. According to the location, most of them were cortical (14 patients; 50%) or cortico-subcortical (5 patients; 17.9%). The lesions were mainly smaller than 5 mm in 16 patients (57.1%) (Fig 3). A, MR angiography of the right common carotid artery before carotid artery stent (CAS) placement, showing a severe stenosis of the proximal internal carotid artery. B, Diffusion-weighted image (DWI) obtained at the same time shows no abnormalities. C, DWI after CAS with a new ipsilateral lesion in the deep territory of the ipsilateral middle cerebral artery. A–D, Normal axial diffusion-weighted image (DWI). E–K, Post-carotid artery stent placement DWI (axial, sagittal, and coronal) with multiple and bilateral cortical new ischemic lesions in the territory of both middle cerebral artery and contralateral anterior and posterior arteries. A, MR angiography of the right common carotid artery before carotid artery stent placement (CAS) with a tandem lesion in the proximal internal carotid artery. B and C, Diffusion-weighted image before (B) and after CAS (C), showing a new lesion <5 mm in the superficial territory of the contralateral middle cerebral artery. Twenty-four of the 122 symptomatic patients (19.8%), and 4 of the 40 asymptomatic patients (10%) showed new ischemic lesions (P < .155). We found a significant relationship between the occurrence of TIA after CAS and the appearance of new DWI lesions in 50% of these patients (P < .03). Lesions in TIA patients were smaller than 5 mm. The patient with the major stroke on day 2 had no new lesions in the DWI done 24 hours after CAS. No significant relationship between the rate of new ischemic foci and several variables such as demographics, clinical presentation, vascular risk factors, plaque characteristics, and CAS-related factors, including type of stent and filter, was found. New ischemic lesions after CAS were detected in 17.3% of our patients. This result improves those reported in most series about detection of focal ischemia by DWI in unprotected and protected CAS.14-20 Only a few articles in the literature focus on the detection of cerebral ischemia after CAS by using distal protection, all done in significantly shorter series of patients. Schlüter et al14 detected new ischemic foci in 10 of 44 procedures (22.7%), and Zwenneke et al15 in 9 of 21 protected CAS (43%). Jaeger et al16 report the appearance of new lesions in 25% of 16 patients undergoing CAS with Angioguard (Cordis/Johnson & Johnson) protection. Nevertheless, we may assume that all intra-arterial procedures harbor a certain risk for embolism and subsequent ischemic events. 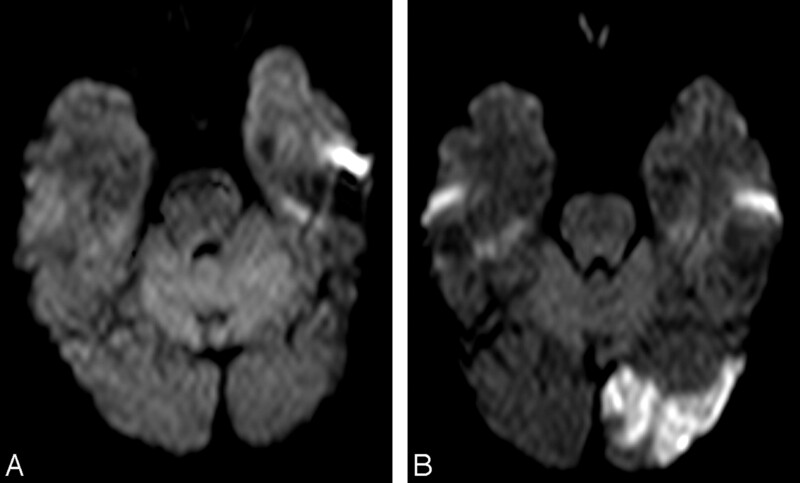 Cerebral embolic events occur after various angiographic procedures, such as 4-vessel intra-arterial digital substraction angiography (IA-DSA) and coronary angiography, mainly caused either by thromboembolism or by air embolism introduced by injection of contrast medium or catheter flushing.21,22 Bendzus et al23 were the first to report DWI as the method for detecting silent embolism after 100 consecutive cerebral angiographies. They found new lesions in 23 patients, all of them without new neurologic deficit. In a recent study by the same author, a significant reduction of these ischemic events was demonstrated with the use of heparin and air filters.24 Some of the new lesions may appear in the territory contralateral to the target artery or in the posterior fossa (Figs 4 and 5). If we exclude in our study the patients with new lesions in the posterior fossa and contralateral MCA territory attributable to the 4-vessel angiography, the percentage of new ipsilateral ischemic lesions should be reduced to 22 patients (13.6%). A, Right common carotid artery MR angiography before carotid artery stent placement (CAS). Ulcerated stenosis of the proximal internal carotid artery (ICA). B–D, Axial diffusion-weighted images (B and C) and apparent diffusion coefficient map (D). Before CAS, ischemic focal lesion >10 mm in the left caudate nucleus, contralateral to the treated ICA. E and F, After CAS, a new lesion is shown in the contralateral posterior fossa. A, Normal diffusion-weighted image before carotid artery stent placement. B, After a successful procedure, a new ischemic cortical lesion >10 mm is seen in the contralateral posterior artery territory. The main advantages of using a filter include the ability to provide flow during CAS and to protect the brain from embolization. Among the caveats are the larger crossing profile of the devices, the lower flexibility and torquability, the risk of microembolization because of flow around and through the filter, the bad apposition in tortuous vessels, and the pore size. Coggia et al 25 detected particulate emboli after each stage of 5 ex vivo angioplasty procedures. The size of most particles was less than 60 μm. As the mean diameter of the pore in the filters commonly used is around 100 μm, those small particulate would be able to pass through the filter device to be trapped by cerebral capillaries and cortical arteries. In fact, findings from another in vitro study proved that embolic material can be found distal to all 4 types of filtering cerebral protection devices studied.26 However, the particulate embolic material found by Ohki et al2 during experimental CAS had an average size of 338 μm, with a range of 120 to 2100 μm. That material would have been retained in the filter, avoiding distal embolization. They did not include intimal strips, which are supposed to be the most potentially dangerous embolic constituents.3 We should consider the pore size as a factor to be highlighted, but not the only one. The difficulty in apposition of the filter to the wall in tortuous vessels, the dislodgement of material during its deployment because of its larger crossing profile and lower flexibility or during its retrieval seem to be as important as the size of the pores in the appearance of ischemia related to embolization and should lead to future studies to facilitate device improvements. The efficacy of the filter can be assumed according to our results, in that the overall 30-day morbidity/mortality was only 4% (TIA in 8 patients and 1 major stroke occurring the second day after CAS, as a result of severe induced hypotension). Fifty percent of the patients with TIA had new ischemic foci after the procedure, showing a strong association between the appearance of new ischemic lesions and the occurrence of TIA post-CAS (P < .03). Several studies have pointed out the effect of carotid endarterectomy (CE) and CAS on cognitive function.7,29 Neuropsychological deficit has been relatively common and is likely to be related to the number of microemboli. In some series, a higher rate of MES was found in CAS patients, though no significant differences in neuropsychological deficit were found, after a 6-month interval, between CE and CAS.7 However, series comparing the real lesional load detected in DWI and the neuropsychological consequences in the short- or long-term after the procedure, providing valuable information on the clinical consequences of the lesions, has not yet been published. The use of filters seems safe and able to reduce the morbidity rate. In any case, new lesions were observed in 17.3% of our patients, and a strong correlation was found between lesion appearance and occurrence of TIA after the procedure. No relationship was found between number of MES detected and appearance of new lesions on DWI. The lower percentage compared with other series, including those of diagnostic angiography, allows us to suggest that neuroprotection is effective. DWI findings are in general clinically silent. The biologic significance and the prognostic value of signal intensity abnormalities in pre-CAS and post-CAS DWI remain uncertain. Neuropsychological outcome may prove to be a subtler test of ischemic insult. In any case, the still-high incidence of new DWI lesions and MES should promote the investigation of safer techniques and devices in CAS. Accepted after revision October 27, 2005.